Deepavali,is a festival celebrated by all Hindus to commemorate Lord Rama and his wife, Sita’s return to Ayodhya after his 14-year exile. It was a dark night when they first returned hence his people lit their houses with little lamps (diyas) so that Rama and Sita could find their way. In many parts of India, the festivities start with Dhanteras followed by Naraka Chaturdasi on second day, Deepavali or laksmi Pujan on the third day, Diwali Padva dedicated to wife–husband relationship on the fourth day, and festivities end with Bhau-Beej dedicated to sister–brother bond on the fifth day. Happy 69th Independence day to all from Indian Vikings. After more than two hundred years of British rule, India finally won back its freedom on 15th August, 1947. All the patriotic hearts rejoiced at seeing India becoming a sovereign nation and the triumph of hundreds and thousands of martyred souls. It was a birth of a new nation and a new beginning. How about participating in a cricket tournament this weekend with “summery” weather predicted in this otherwise rainy summer in Trondheim? ‘Indian Vikings’ for the first time is planning to organize a cricket tournament on 22-23rd August in Steindal skole, Nardo. In that regard, the organizing committee of the Indian Vikings like to know whether your team would be interested to participate in this tournament? The plan is to have 12 overs per side matches with final match to be played on Sunday. Tennis balls will be used for all the matches. Same rules will be followed as for other tournaments organised on that ground. The tournament fee will be NOK 300 per participating team. The prize will be Nok2000 for winning team and Nok1000 for runnersup. Please confirm your availability latest by Tuesday, 18th August by 12:00 PM, so that we can do the necessary arrangements to organize the tournament in a good way. 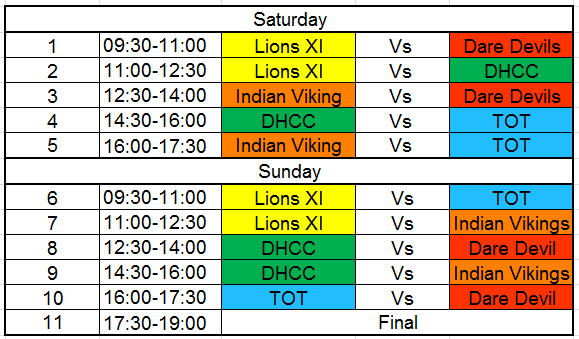 Further details about match schedule and time slots will be conveyed once we hear from all the team captains. Hope many teams would participate in this first edition of “Indian Vikings” cricket tournament and make it a fun filled weekend. According to Scripture, that Jesus came back to life, or was raised from the dead, three days after his death on the cross. As part of the Easter season, the death of Jesus Christ by crucifixion is commemorated on Good Friday, always the Friday just before Easter. Through his death, burial, and resurrection, Jesus paid the penalty for sin, thus purchasing for all who believe in him, eternal life in Christ Jesus. Easter is an important holiday in Norway, giving Norwegians a chance to celebrate the arrival of spring after the long, dark winter. Despite being a predominantly secular country, this holiday is eagerly welcomed by the people of Norway as a chance to celebrate the arrival of spring and to spend time with friends and family over a lengthy break from work and school. The Norwegian word for Easter is Påske, a name derived from the Hebrew word “Pesach/Pasah” or Passover. In Norway, however, Easter does not pass over very quickly. Norway has the world’s longest Easter holiday. Traditionally, Norwegian shops and work places are closed over skjærtorsdag (Maundy Thursday), langfredag (Good Friday) and the Monday following Easter Sunday, known as andre påskedag, or the Second Easter Day. Schools are usually closed for the entire week preceding Easter.